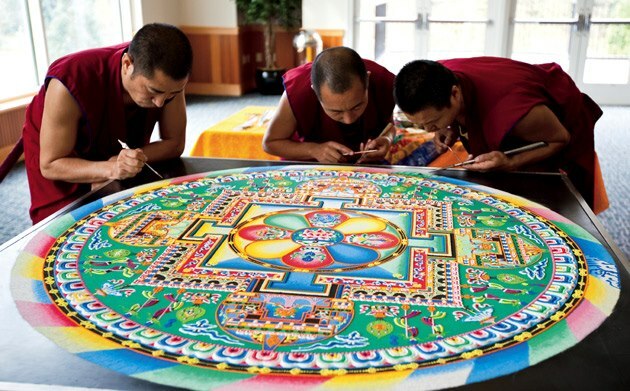 While studying traditions from around the world, our pre-Kindergartners learned about the detailed ephemeral sand mandalas carefully created by Tibetan monks. We created our own, more permanent version by stamping and tracing geometric shapes with glue. and at each step, excess sand was shaken off (very exciting). Students experienced the creation radial symmetry, worked together in collaboration, and practiced decision making while choosing colors and shapes for their mandala design. Lesson plan (including pre-K Visual Arts Standards) here!